I hope you have all enjoyed your break from the challenge. I know many schools in the northern hemisphere are on spring break while some schools in the southern hemisphere are on Easter break or term 1 holidays. So I thought, why not have a break from blogging? It will allow some students to catch up on some challenges they might have missed due to camp or other school activities. Did you enjoy your break? What did you do? I hope you visited some of the blogs I have highlighted in previous posts. Maybe you visited some blogs to leave comments. Leave a comment here about what you did in your break. This break I went to Hawaii and had a blast! I went on hikes and I also saw a few historical land marks, inculding pearl harbor. I had the most fun in the warm, beautiful ocean, and I also had a lot of fun just being with my family. That is what I did this break. We were down there for a week playing 4 games. We only won one game & that was our last. I didn’t do much over the Spring Break because I was sick and it wasn’t fun! The only time when I got out of my house is when I walked to the mail box. That was fun. During spring break I went to Cocoa Beach Florida. I went there for a baseball spring training trip. We left from Milwaukee Wisconsin monday morning and flew straight to Florida. It was about 80 degrees every day and really sunny. We played five baseball games at the Cocoa Expo Sports Complex in Cocoa Beach Florida. We played two teams from Kentucky, one team from ohio, one team from Minnesota, and one team from New Jersey. We won two out of the five games we played. We had one day that we didn’t have any games so we went to the beach. It was a blast! We also went to one of the malls in Cocoa Beach and walked aound. I had a great spring break. We just got back to school today and I am very tried i slept in all spring break at least tell 11 am every morning it was a very nice change. The thing i will miss most about this spring break is the time i spent sleeping i caught up on a lot of sleep. I also got a lot of driving practice during spring break we drove to GreenBay and the Appleton multiple times. During break i went to Florida. Our whole softball team went. We went to play other softball teams from different states. The vacation in Florida was 7 days long! We left on sunday and got back late sunday night. I believe it was a great experiance. It was a good team bonding trip. While we were done there we went to many different place. We went to cocoa beach, movie theater, mall, and multiple food places! I didn’t do much for spring break. I live in Wisconsin and the weather was really nice but for a couple of days there was some crazy wind. I had to work a lot all break so I didn’t have a chance to go out much. I work at a Bakery and usually package the leftovers and clean up. Monday I worked and after work I went to my best friend Holly’s house and we hung out. Tuesday I stayed at Holly’s all day. Wednesday I worked. Thursday I worked and biked to my friend Emily’s house. Friday I worked and went to my Uncle’s right after. Every year for Good Friday we have a huge fish fry at his house. Saturday I worked eight hours and plus because everyone had orders from the bakery for Easter Sunday. And Sunday I went to church with my family and then we went to my Grandma’s for Lunch. After that we went to my Uncle’s again and ate even more and because I have a lot of younger cousins and my uncle lives on a big enough chunk of land we had an Easter egg hunt. Then I went home and that was pretty much my whole break. i went to my freind kylies then i went to another persons house in black creek i alsohung out at my buddie matts who lives in black creek. then ii went up north by my grandmas house in silver cliff. then i went to my other grandmas in seymour were i live. My spring break was pretty fun! Spent a lot of time outside like playing basketball, soccer, and softball, rode horses, and had a water fight. Also went shopping and got these awesome sweat pants they are so comfortable. I think that spring break ended to fast though. Cant wait till summer break now!! During this past week long spring break, I went to a couple cities and got some other things done. I am from the Mid-Eastern Wisconsin and I live on a farm so I wasn’t able to do too much or go too far away for a while. But my family and I went down to Gurney, Illinois for a day then we went to Chicago to visit a cousin and go and see the zoo there. The next day we went back to Gurney to do some more shopping then left for home. Back at home we had to separate some of our cattle, we had to separate last year’s calves from the cows. This is so that when the cows have their calves withen the next few months the older calves won’t hurt them. On Easter Sunday my family and I went to my dad’s side of the family first, then to my mom’s side after. On the way to my aunt’s house my dad was turning the corner a little fast, and the baked beans spilled all over the back seats. There’s nothing like the smell/look of spilled beans in a vehicle so I ended my break by cleaning up the mess. It was also my Mom’s birthday on Easter, so we had cake for her at each place we went for Easter. This is a sum up of my 2010 spring break. Hello I am from seymour wisconsin and over this last week i was in a really bad car crash. It all happened when i was driving home with a friend and are other freinds where driving beheind us and we were trying to pass a car and the shoulder was lower than the road so the car was pulled into the ditch,so i tryed to save it and i turned the whell but the car was amied at the other car so i had to turn it again and the cars tires didn’t grip the pavement so we ended up slidding 50 feet and flipping the car three times and it landed on its roof. I was able to get out but my friend was traped in the car,on the way to the Shawnao hospital i was in shock and all i could think about was my best friend and i wanted to know if he was alright. Later that day we where both able to go home my friend has a concusion and a head ache, i got the worst of the crash i have a black eye and a bad concusion and i am sore and have over 75 cuts on my body. So thats what happened on my spring break. I had a pretty good break. Most of the week i laid around bored. Sunday i worked. Monday i worked round my house and then i went to my girlfriends house, Tuesday i did the same thing, Wednesday i went to church later in the day after laying around, Thursday i worked til noon, then my girlfriend came over for my little brothers 9th birthday and we went to church and watched some movies. Friday i slept in late, and went out to eat for supper at the Seymour hotel for fish. Saturday i went to my little cousins 2nd year old birthday and then i had my girlfriend over. Sunday, Easter i worked all day, I work at Doxbees. Its a buffet, we had a little under 1500 people come in. It was so busy. We didn’t get done until 3 hours later than we normally do. My spring break was pretty good. i spent my break in milwaukee, wisconsin. I have a brother and a sister who lives there. It’s about two hours away from where in live Black Creek,Wisconsin. I didn’t do much but it was nice to be there and seeing my nephew and siblings. I went shopping with my sister, and we went out to eat with my brother, and we usually eat chinese food when we go out, because i love eating chinese when we are out and about and all hungry. The last thing i really did was go fishing with my brothers and sister in law for a bit and then we went home and played games. It was really fun. Break was good, but it could of been better. Over my break I had softball practice from 9-11 in the morning Monday – Thursday. The weather was so nice. One day it was 79*. I played catch with my older brother and my neighbor for two hours and got sun burn. Saturday me and my mom painted her bathroom, white. It took us three hours to paint the whole thing. I had a blast! I love to paint. Easter was fun. I didn’t get an Easter basket, :(, too old I guess. But oh well, I got to be with my family; aunts, uncles, cousins, grandma & grandpa. Hello, I’m from Seymour WI, a little town close to Green Bay. We got back from break, My break was really nice i must say… It was a good time to chill and relax. I helped my aunt move and i helped my grandpa do some yard work. Also, I got my hair cut. Thats pretty much all i did other than hanging out with my freinds. All I did over break was eat, sleep, and play games. On my Spring break,I worked Monday through Saturday. On Wednesday I worked a 9 hour day. I talked to my girlfriend a lot and we tried to make plans to go see the movie Clash of the Titans, but we couldn’t because her mother is crazy. This spring break i went to my aunts for Easter but otherwise most of the time i was golfing to get ready for my season. Then i also stayed at my friends and played some soccer. Otherwise it was a pretty chill weekend. Spring break was fun. i went to stergeon bay with my ma dad sisters my brother and my friend J.
I’m Keith from Seymour, WI what i did over spring break was mostly golf and fished. For my Spring Break ’10 I hung out in Seymour and Shawano mainly. What I did was hanging out with my friends and family. On Friday and Saturday I was with Cole a lot, also Abbi, Jenna, Janelle and Anna. Sunday I was with my family if I remeber correctly. OH, and Saturday I also went to my little cousin’s 4th birthday party! Monday I think I went with Abbey to HuHot and the rest of the week I don’t really remember the rest. Not for any bad reasons but just because I did a lot this spring break, but I kind of wish I could’ve gone some place tropical! Well over break i got to baby sit a rabbit named peanut it’s not my bunny it’s our small animal care teachers and i thought that i would have nothing to do over break so i was going to babysit this bunny well my ma calls it the devil rabbit because it would bit people it bit my friend Laura 6 times in 2 days it was funny. then i had to help my uncle jeff he lives in seymour we had to help him with cutting the calfs horns off and nuter them and he had to clean the barns then after that we got to go to my uncle Deans who lives down the road and drive their new go-cart it was fun even though it would shake like crazy. thats pretty much what i did to some it up. annd ahh yeah thats pretty much it. i didnt really do much over my spring break. i went to my grandmas and rode our four-wheelers that was a lot of fun. the best part about it was riding a wheely all the way down the drive way with the quad. my grandma wasnt too happy about her yard getting tore up though. i also spent a lot of time with my girlfriend sierra thats always fun. other than that i didnt do that much a lot just enjoyed not having to go to school and took advantage of being able to sleep in till noon everyday. during break a couple of friend of mine hung out out at their house. we went to appleton WI and hung out at the mall and went to the movies. we had a good time over break. I had a very good spring break. I hung out with a bunch of my friends in a little town called Seymour, Wisconsin. We went to the mall and shopped for summer clothes. I also went to a surprise birthday party which was really fun. Easter was also fun with the family, the easter bunny came and gave me lots of candy, which is pretty much gone now. The best part was the late nights with friends and being able to sleep in. I wish we could start all over and do it again. Over spring break I didn’t really do that much. I hung out with my friends at the mall and ended up staying over night at her house. I babysat my siblings while my parents worked which wasn’t that bad and I went to my grandmother’s house to celebrate Easter. I also went outside and enjoyed the warm weather when it was around by playing some basketball and soccer. i had a nice spring break. i woke up, ate breakfast, took a shower and went back to sleep. i would go to the gym and play 5 on 5 basketball in green bay. so pretty much it was an alright week. Well, my spring break was pretty boring, actually. Most of my family went up to Minnesota, save me and my stepdad. He had to work, and I had golf practice. I spent most of that week just lying around my place, sleeping and playing my Wii. Easter was fun, because I did a scripture reading at my church, and we went to a buffet afterward. I’m from Seymour, Wisconsin, where we just got back from Easter break. I went to a zoo, a lock-in, and learned I play baseball better RIGHT-handed (I’m left-handed). I also built a virtual Lego “Mona Lisa”. I live in Wisconsin and my spring break was pretty good, but I still wish I was on break. During my break I got to hang with my friends which was really fun.Also, I got to go shopping for my shoes for dance. On Easter, my family and I went over to my grandmas. It was fun because my cousins were there. Also, it was my brothers birthday on Easter so we got to celebrate that. So, that was my spring break. I had a great time on my spring break. I did lots of fun stuff and activities over break. I was doing stuff like 4-wheeling,working, and other fun things. I wish we could have a little longer break. On my spring break in wisconsin I hung out with my cousins and friends. My cousins and I went fishing and had easter together with the whole family. I watched movies and parkour’ed with my friends. I had fun over spring break. I went bowling, fishing, and hung out with my friends. I was a really good time. Hello, My name is Jared and i live in the United States in the state of Wisconsin in the northeast part of the state. We officially just got done with our spring break, we had 10 days off and i spent most of my time off golfing and spending time with my buddys. I live in Wisconsin and i spent my spring break in Florida. It was an 18 hour drive! I was excited to visit Panama City. I had a great time relaxing and getting a tan. I’m not thrilled to be back at school. My break in Wisconsin (North America) was fantastic. The weather here was in the 60’s, which in Wisconsin this time of year is nice. All the snow is gone too. The grass is turning green. I was able to get the winter coats off the horses and they enjoyed that too. I traveled 2 hours to my mother’s for dinner (I took my kids with me). I also did a little painting around the house. For fun, I took the kids on a picnic and lots of walks. They seemed to enjoy that. I did some training with our dog since she’s still a puppy, but she ended up running over to the neighbors and killed kids’ easter rabbits (they were presents). I feel TERRIBLE about that. I guess I have a lot more training to do. Other than that, I had a wonderful break. I hope it gave me the energy I need to push through the rest of the year! yeah im from Wisconsin and i had a fun spring break. what i did during spring break was go paintballing, go to my friend Rodney birthday party, went shopping at the Appleton mall and got new Jordans, went to see the clash of titans with dwayne and alissa, and what i did every day is just hangout with my friends in onieda. Im from Wisconsin…Over spring break i hung out with a lot of people. Went to another town to hang for a bit, spent time down by my dad, spent the day in the city shopping. Spent time with my brother on Easter :] Had fun pretty much, was a pretty eventful break. Here in Wisconsin it was nice over break.. The coldness somewhat disapperared, and some warmth came! But now i’m kinda happy to be back at school to see all my friends, and NOT work! Also my parents let me goto my friends house! A friend that i haven’t seen since the summer of 2009 so that was a good thing! ! It was so great to hang out with old friends! What i did was hang out with my sister Shannon and her now ex-boyfriend Matt, we went out side and played attempted to get a tan (equals fail) and kylie my best friend came over we hung out at wal-mart best time ever we stalked two yummy guys 😀 then my grandma took me to the Colourbox to get the monroe piercing over all spring break was a blast and today is my Birthday yay!!!! Over this break I got to spend some time with my family. But mostly, I had to work. I raise calves on a farm, so I get to spend a lot outside, which I like a lot! I played soccer, hang out with my family and spend a lot of time outside. I really didn’t do more then that because my friends were busy and I really like just being outside and being with my animals. Also my parents let me goto my friends house! A friend that i haven’t seen since the summer of 2009 so that was a good thing! :)! It was so great to hang out with old friends! I worked most of the break. I finished my truck up and got it all decked out in stainless. Over spring break 2010 I went to Cave of the Mounds and House on the Rock. I also went shopping and worked. Here in Wisconsin, USA, we had Spring Break last week. We are finally back at school today! Though it was a great break, I’m glad to be back at school. I got a lot done last week that I normally wouldn’t have even tried to do. I cleaned my room, cleaned the bathroom, and cleaned part of the living room! And it’s all so I could have fun! It was totally worth it. I hung out with my best friends almost every day of the week, went for walks, went to the mall, went to Wal-Mart, and just drove around town aimlessly. It was awesome! This has been the best break of my life… If Spring Break was THIS good, I can’t wait to see what summer has to offer this year! Well, I really didn’t do much during my spring break! I just went up north and chilled. It was really nice because it was warm out all week!I rode the ATV, went through some trails, and had a campfire. It was a great spring break. Just…I wish my friends could have been there!!! Here in Seymour, WI we are just getting back from Spring Break… What I did during my week off was that I worked for 2 days and went shopping A LOT! Got some cool new stuff. Went to see the Last Song… movie with Miley Cyrus and Liem Hemsworth. I first had read the book and then went to go to see the movie in the theatres. There wasn’t much a difference between the book and the movie besides some minor details. I had a very nice time on break. It was great to have the much needed time off from school and homework. Over break I spent time fishing, shopping, playing soccer, and hanging out with family. I hope everyone had/has a wonderful time on break enjoying their Easter. In Argentina we are in our Easter Break. We’ll go back to school on Monday, April 5th. Please visit our blog to read about what my students in Y6 have been doing during these four days! Thank you! We’ll come back! How long do you get off? We took a week off. 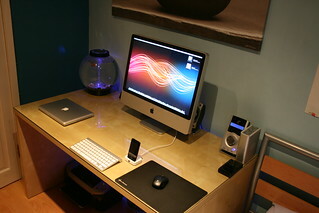 What a nice, clean desk! Mine looks very similar to that, with the same wood and computer, but a big mess all around it. Mine is more like yours, except I don’t know where anything is. Sorry to tell you ladies, but that is not my desk in the picture. Wish it was though! !